RADON GAS IS EVERYWHERE,THE OUTDOOR LEVELS AVERAGE AT ABOUT 1.5 pCiL. THE INDOOR ACTION LEVEL IN THE US CURRENTLY IS 4pCiL. EXPOSURE TO HIGH LEVELS OF RADON GAS CAUSES LUNG CANCER!!! Radon has be shown to be the second leading cause of lung cancer, and number one cause among NON SMOKERS. *RADON IS A CLASS A CARCINOGEN THAT IS KNOWN TO CAUSE LUNG CANCER IN HUMANS. IT IS ESTIMATED TO CAUSE BETWEEN 15,000 TO 22,000 LUNG CANCER DEATHS A YEAR. *NEW STUDIES ARE BEGINING TO LINK RADON GAS WITH ALZEIMERS AND PARKINSONS DISEASE. HOW MUCH IS IN YOUR HOME? Still do not want to test? Please read the Radon waiver . If levels are found to be higher than 4pCiL You should contact a licensed radon mitigation service to install a radon remediation system.The remediation is not that costly and the installation of a system is really not that intrusive. I AM LICENSED BY ILLINOIS EMERGENCY MANAGEMENT AGENCY'S DIVISION OF NUCLEAR SAFETY (DNS) AS A RADON MEASUREMENT TECHNICIAN. Radon measurements are performed with a CRM - Continuous Radon Monitor. -these devices record real-time continuous measurements of radon gas. The measurements are typically short-term tests, mostly in conjuction with real estate transactions and are highly recomended for anyone buying , or selling a home. These tests are a minimum of 48 hours and do require that "Closed Building Conditions" be maintained in the home for the testing period (and 12 hours prior if only 48 hours of data is to be collected). A full report is sent on the same day as the end of the test. You may also request a longer measurement of the home after the sale, or a measurement of your current home. Every home that has not been tested should be tested for Radon. A test should be conducted every two years. *RADON GAS IS A NATURALY OCCURING,COLORLESS , ODORLESS, TASTELESS, RADIOACTIVE, AND INVISIBLE GAS THAT WILL DECAY IN TO LARGE ALPHA PARTICLES THAT CHANGE TO POLONIUM. AN ALPHA PARTICLE IS ESSENTIALLY HELIUM WITH ITS ELECTRONS REMOVED. RADON GAS IS PRODUCED FROM THE NATURAL BREAKDOWN OF URANIUM IN SOIL , ROCK AND WATER. STACK EFFECT CAN DRAW RADON INTO THE HOME THROUGH CONCRETE, CRACKS AND HOLES IN THE FOUNDATION; WHERE EVER MOISTURE CAN PASS THROUGH A MATERIAL INTO THE HOME IS A POSSIBLE ENTRY POINT FOR RADON GAS AS WELL. ABOUT 38% OF HOMES IN THE CHICAGO LAND AREA WERE FOUND TO HAVE ELEVATED LEVELS OF RADON. ALL HOMES SHOULD BE TESTED. IF IT IS FOUND IN LEVELS ABOVE 4pCiL YOUR HOME, IT CAN BE EASILY FIXED (MITIGATED) TO REDUCE LEVELS TO A MORE ACCEPTABLE RANGE. THE COST IS NOT MUCH MORE THAN A TYPICAL HOME REPAIR. PLEASE NOTE: A MEASUREMENT TECHNICIAN CAN NOT INSTALL MITIGATION SYSTEMS, AND CONVERSELY A MITIGATION TECH CANNOT TEST INITIALLY IN YOUR HOME AND THEN INSTALL A SYSTEM. STATE PROCEEDURES HELP AVOID INHERENT CONFLICTS OF INTEREST THAT CAN ARISE. 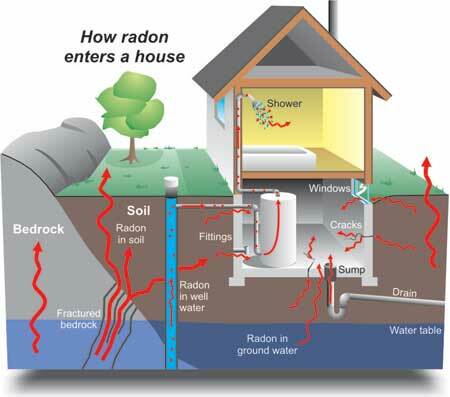 Please visit the radon section on "links" page for more information on RADON GAS.